Yosemite Nature Notes 46(2) (or 46(2A)) (August 1977) edited by Steven Medley and Henry Berrey. Note that this volume has two issues with the same number, no. 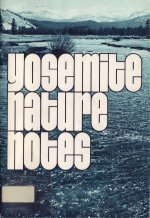 2: Yosemite (above) and this issue, Yosemite Nature Notes. To reduce confusion, this issue is sometimes referred to as no. 2A. Digitized by Dan Anderson, February and September 2007, from copies at San Diego Public Library and University of California Berkeley Marian Koshland Bioscience and Natural Resources Library. These files may be used for any non-commercial purpose, provided this notice is left intact.